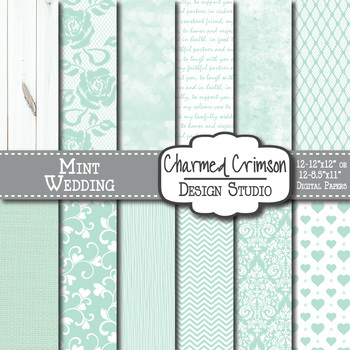 A beautiful pack of 12 different mint wedding/bridal digital papers in two sizes. Patterns include wood, roses, lace, vows, heart, granite, linen, damask, and chevron. 1165 - Copyright 2015-2019 © Charmed Crimson ~ All Rights Reserved.